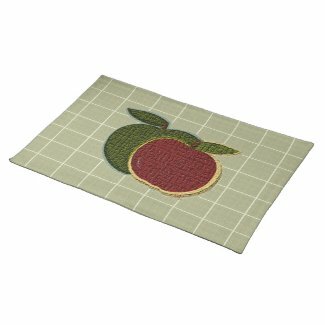 Setting a table with country apple placemats can add a lot to your kitchen decor. Keep the placemats set on the table all day for a great addition. 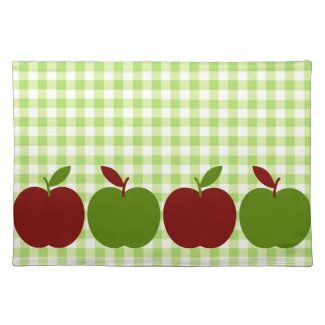 These apple placemats are all designed with a country effect so they will go well in any country apple theme kitchen. Many people only think of their kitchen table as the place to eat, but forget that what decorates the table can be part of their chosen theme decor. We often think about a centerpiece that sits on the table all day long, but now you can think about placemats as well. These are the kind of accents that will bring your kitchen into a complete theme. If you have a country apple look in your kitchen, you probably have lots of accent pieces and accessories around your kitchen. Things like apple cookie jars, an apple kitchen rug, even apple wall decals on the walls. Yes, these kinds of decor make a great effect. Now carry that effect to your table. Set up your centerpiece to match or complement your country apple placemats, add in a set of apple salt and pepper shakers and napkin holder and your table will complete the look of country apple in your kitchen. Each of the designs featured here has a matching cloth napkin. This will make a nice look for your table, but you aren’t limited to just the match. Try using cloth or paper napkins in a solid color that picks up one of the accent colors in your placemat. Look at the additional colors in these featured placemats. For a country apple look, dark red, forest green, tan, brown even white will work as solid colored napkins to accent your table decor. Each of the designs I have featured here is made from 100% woven cotton. These are all natural fibers so they have a comfortable look of handcrafted. They measure a nice 20 inches wide by 14 inches tall. Best of all, they are machine washable. For any placemats in my kitchen, that’s a requirement. All are available to order through Zazzle. Be sure to check out more apple design placemats and find the perfect set for your own kitchen. These are really neat placemats for the kitchen. We do use placemats around our home. I even use them in my craft room to protect my craft table top from hot glue and scissors. 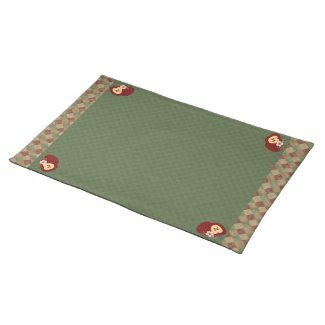 Oh– I see just the placemats that I would love! The gingham and apples would really brighten up our kitchen table. I can use them in the fall and spring/summer!